I love the fresh, crunchy taste that sprouts give to salads and sandwiches. Lots of different kinds of seeds can be sprouted and eaten. Some favorites are alfalfa, radish, broccoli, and lentils. Although you can buy special containers to grow your own sprouts, all you really need is a clean jar and some cheesecloth. 1. 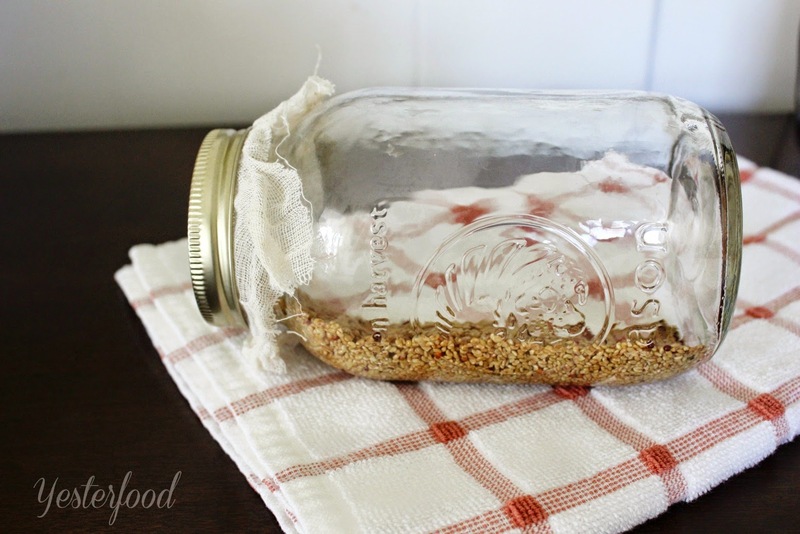 Put about a tablespoon of seeds in a clean jar, and put cheesecloth over the top of the jar. I used a canning ring to hold the cloth on. You could use a rubber band. Rinse the seeds very well, 2 or 3 times, and allow to drain. Set the jar away on its side. It does not have to be in sunlight- in fact, some sources say to place the jar in a dark area. I set mine on the kitchen counter. 2. Every morning and every night, rinse the seeds very well by filling, swishing, and draining the jar. Leave the cheesecloth on and let the water drain out. Drain off as much water as you can. 3. Keep rinsing and draining the sprouts twice a day until the sprouts are the size you want- usually 3 to 5 days, depending on what kinds of seeds you are using. 4. The last day, you can leave them in a sunny window for a few hours to green up a little, if you'd like. 5. They are now ready to enjoy. Refrigerate leftovers, tightly covered (remove the cheesecloth and cover the jar well, or transfer to another tightly covered container to refrigerate). Sprouts will keep in the refrigerator for a few days. Where to get seeds for sprouting: Seeds intended for the garden may have been treated with chemicals, and probably are not intended for direct consumption. Some health food stores and supermarkets carry seeds for sprouting- Whole Foods does, I think. I live in a smaller town, so I order mine from Amazon.com. Just put in a search for "seeds for sprouting" or "sprouts" and you'll get all kinds of results. http://www.foodsafety.gov/ states, "Like any fresh produce that is consumed raw or lightly cooked, sprouts carry a risk of foodborne illness such as salmonella or E coli." Visit the site for more information. I have had sprouts, kind of icky but I know they are so packed full of healthiness that I should eat them. Thanks for the tute!! Sprouts may not be for everyone! ;) I will say, though, that sprouts are sometimes (ok, often) not in the best shape by the time you buy them, so freshness is pretty key here. :) Thanks for coming by! Thank you for joining us at the Weekend Social this sandwich really caught my eye!!! Thanks for sharing it with us!!! I have to start doing that! It is so good everywhere! I love sprouts but they always go bad before I can eat them all. I have to try this it's so simple and you can make the amount you want. I gotta try this with bean sprouts too. Seen on Eat Create Party. 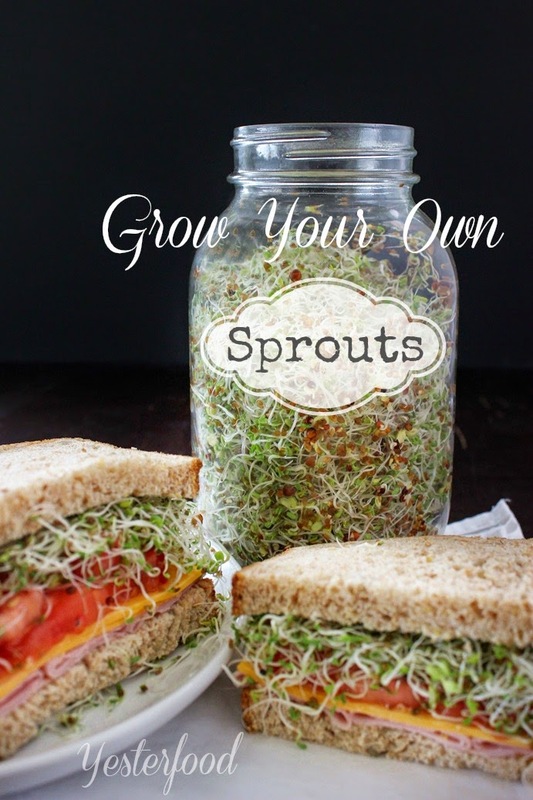 I love adding sprouts to sandwiches...and I honestly never knew that you could grow them like this! Very easy! :D Easier, cheaper, and much fresher! I love sprouts too. I am going to try this. I love any way to grow our own food! 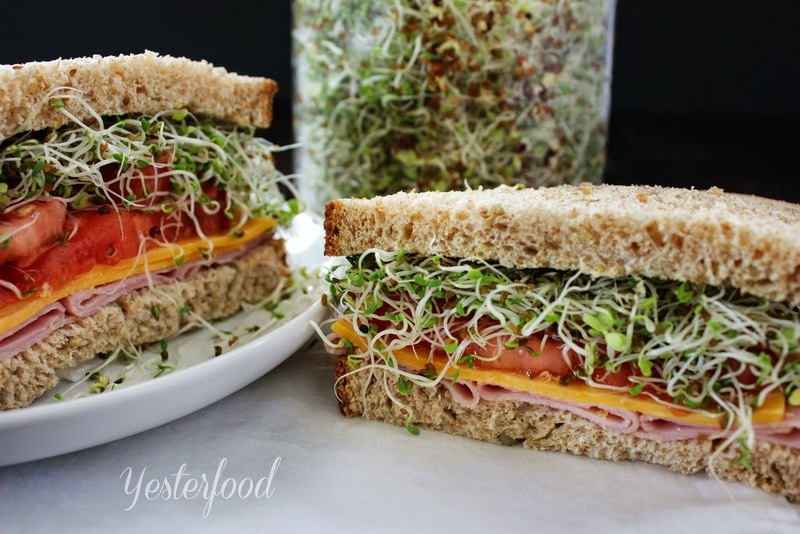 Joy, I absolutely love putting sprouts on sandwiches and never even thought to grow my own! Love this idea and thank you so much for sharing! Hugs! This took me back! 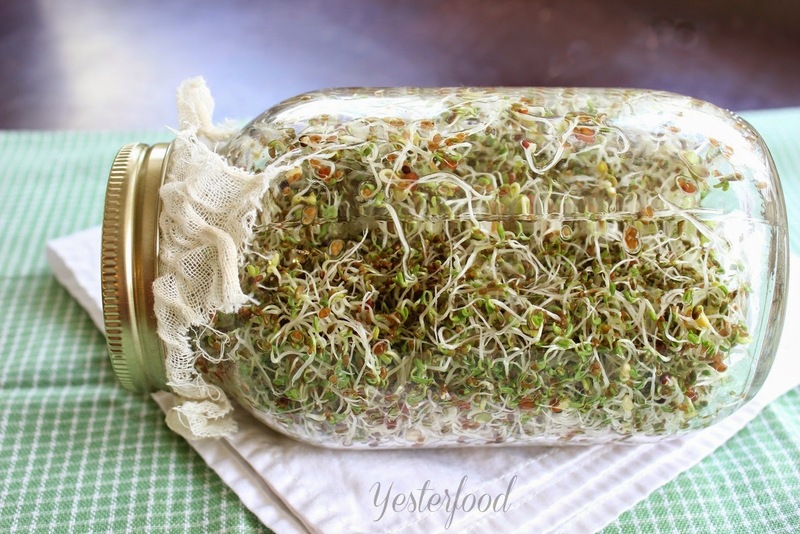 I used to have a friend back in the day (think late 60s early 70s) who always had a fresh jar of alfalfa sprouts on the kitchen counter. They were so good in a sandwich but I haven't thought to use them in ages! Thanks for the tutorial -- this would be fun for grandchildren to do, too! Especially during the summer. Hi Joy, your photo is awesome and I was definitely curious about growing my own sprouts. I will definitely try this. I know my grandson will love to see them grow, I hope he'll want to try them too. Thanks so much for sharing. Your gorgeous photo brought me over from the The Weekend re-Treat! I love sprouts! I have always wanted to try growing my own and now that I have seen how easy it is, I will have to give it a try. Have a great weekend. What a great idea. I love sprouts. I have to get this started today! What a fun project to do the the grandgirls. Well this sounds silly, but where are you getting the seeds? Are you just literally buying a packet of alfafa or clover seeds from a nursery and opening the packet? I've seen dried lentils in a store of course, but, perhaps you could expend a bit on how you get the seeds, and, if the kind in a packet are acceptable, or do they need to be some special type, etc. Thanks! That's a great question, and I should have said something about it in my post. :) I'm not sure I would go with the nursery seeds- they might be fine, but I don't know if they're OK for direct consumption like that. Some larger health food stores and supermarkets carry seeds for sprouting- Whole Foods does, I think. I live in a smaller town, so I order mine from Amazon.com. Just put in a search for "seeds for sprouting" or "sprouts" and you'll get all kinds of results. Hope this helps- thanks for coming by! Wow I didn't know it was that easy. I'm totally going to try this. I love sprouts. I used to order a delicious sandwich at this great Portland cafe back in high school, it was called a CAB sandwich (cream cheese, avocado, brussels sprouts). It's a flavorful way to enjoy sprouts. I have to admit that I've never tried sprouts. Growing them looks really interesting! Wow this is awesome - sprouts are so healthy yet they are expensive and go bad quickly! Thanks for sharing and linking up again with us at the #WWDParty. Have a wonderful week ahead. What a great idea growing your own sprouts. Thanks for sharing on Real Food Fridays Blog Hop. Will pin and share on google. i've been growing my own for a few months now. However, this method easily beats the way i've been doing it! so excited to try it! Thank you! Joy, I can never find sprouts here. Well fresh sprouts anyway. I can't wait to try your method. I have an Avocado Delight Sandwich recipe just waiting for fresh sprouts. I love alfalfa sprouts on salads and sandwiches but I'll have to try other kinds too. I have a nifty jar top and screen combo that works very well -- I love to watch them grow! I love sprouts. I am definitely going to try this! Thanks for sharing on Foodie Friends Friday. I used to do this when I was a kid in the 1970's... thanks for sharing your sprouts with us on Foodie Friday. Pinned. Who knew it was so easy to grow them yourself? Thanks for sharing this method, Joy. Very cool! I had no idea you could do this yourself - but of course I am pretty clueless about "gardening!" The sandwiches look so healthy. I'm going to try it! We can't buy these locally anymore, I had no idea it was this easy, thanks for sharing at Weekend Potluck! If you can link back to us within your post, I'd like to vote for you this week to be shared at our Potluck. Wow - you always have the best ideas! Had no idea you could grow sprouts this way. It would be a fun project for kids to do too. Have a great week! I love this!! Can't wait to give this a try!!! This is amazing, I can't wait to try to make these. I eat sprouts on my sandwiches everyday! Thanks for the awesome tip!! Tammy, thank you so much- we really love sprouts, too! Thank you for pinning and for hosting! This is so neat! We're not big sprout fans, but I think it depends on the kind of seeds you use. Thank you so much for joining us this week, at Simple Supper Tuesday. I've been meaning to do this forever. Think I'll do it this week, Thanks for the reminder! Oh my gosh this looks like such a fun thing to grow and eat. My youngest dd loves to grow things (she has her own garden) and I know she would be thrilled to see how fast this grows. Thanks for sharing on Merry Monday. Erlene, you are right- kids love these because they are easy and fast- you get to see results really quickly! :) Thanks for hosting! Hi Joy. Just wanted to lyk that you've been featured on this weeks Merry Monday. Hope to see you again. Hi Joy! I love this idea. I am featuring it this week on #TheWeekendSocial! Thanks so much for bringing it by. I am so inspired by you! I hope to see you again this week. Thank you so much for sharing on the Thursday Blog Hop! I needed this post. OMG its like watching a chia pet grow, how cool! Thank you for sharing it on our Four Seasons Blog Hop. This is just plain fascinating to me! It would make a tasty science experiment for my kiddos! Thanks for sharing this at my Creative Ways Link Party! Hi Joy, I choose you post as one of my features this week on Real Food Fridays Blog Hop. Thanks so much for sharing your great information and hope to see you every week on Real Food Fridays Blog Hop. Have a healthy happy weekend! I've never tried sprouts, but I might have to. Where do you get your seeds? Thank you for sharing at What We Accomplished Wednesdays. Have a great week! Joy, I am SO doing this! It's one of my boys' favorites to put in their sandwiches. Thank you for sharing how to do this with all of us at the Show Stopper party this week! What a fun idea! Can't wait to try this! Yum! I love sprouts! Really need to try this. Thanks for sharing with SYC. Love this recipe! We will have to try this one out!! Thanks for much for linking up with us on the How-To Tuesdays link party! G'day! Love this recipe too Joy! Congrats on being the Featured Foodie via #TheWeekendSocial - Link Party & Blog Hop #19! Very nice post, love sprouts, Thanks for sharing with Hearth and Soul blog hop. Thank you for sharing this post with us at the Hearth and Soul Hop, Joy! My late Mom used to grow her own sprouts but I had totally forgotten about it. 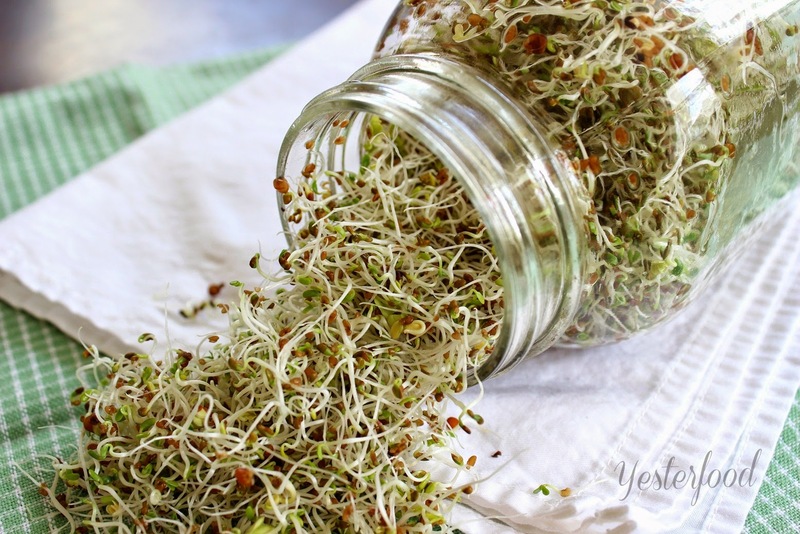 This is an excellent tutorial and a great reminder of how delicious and healthy sprouts can be! What a great idea, I can almost taste these great sprouts. I can't wait to get my sprouts going. Thanks so much for sharing your awesome post with Full Plate Thursday and hope you have a great week! I remember growing sprouts when I was younger. The sandwiches you've put them into look delicious! Thanks for linking up to Sweet and Savoury Sunday, stop by and link up again. Have a great day!! I just bought sprouts for $1.99 for a small container. I think its time to give the home grown version a try. Thanks for the wonderful pictures of the process too. I have been meaning to look up a tutorial on sprouting, and there you were in the SITS linkup. Going to bookmark and pin this! Hello dear! May I know which seeds you used for this picture? This is very helpful. 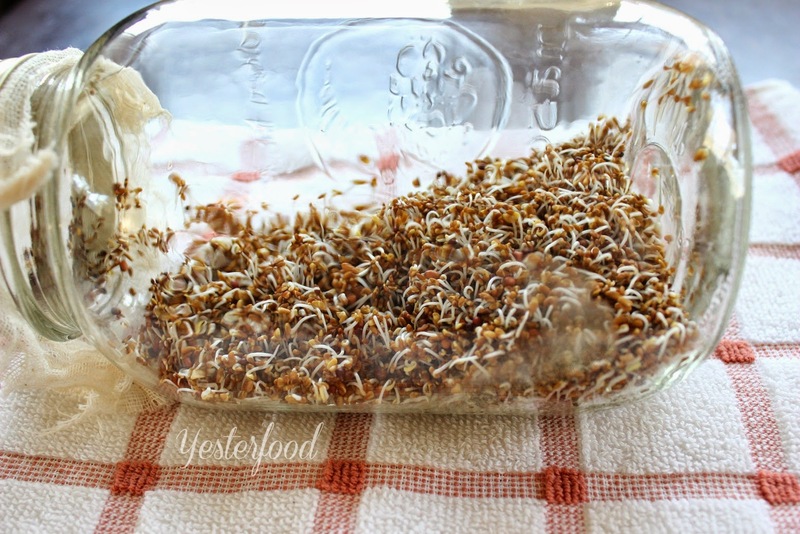 I thinks growing your grow sprouts can be an interesting project for kids too ! Wow, I love this tutorial!! I've seen several, but this is the first one that was simple enough I think I can actually do it. I just started making water kefir, so this should be easy peasy, right?? Your recipe is featured at Full Plate Thursday this week. Hope you enjoy your weekend and your new Red Plate! Hi there to all, it's genuinely nice for me to visit this blog, it contains valuable information which I was looking for a long time. I never used to like sprouts when I was young, but these look delicious! Sprouts are so nutritious. I think it is safer to sprout at home than to purchase sprouts.so thank you so much for sharing your wonderful, easy to follow sprouting tutorial at the Healthy, Happy, Green and Natural Party Blog Hop. I'm pinning and sharing! I need to get some seeds from health food store. Garden seeds are treated and are not safe for sprouting. I have grown sprouts in the past. Micro-greens are also fun to grow. I am ready for spring. This is great....forgot all about sprouts! I love sprouts!! Thanks for sharing on My 2 Favorite Things on Thursday! Hope to see you again tomorrow!! Pinned!